Get our free report, "What You Should Know About Your Water"
"What You Should Know About Your Water"
This report will give you insights to what is affecting your the most valuable resource you have, your water. Hydrofracturing (or hydrofracking) is a process that may be used to increase the flow of water into a well. It is usually applied to low yielding wells. There are many instances of hydrofracturing resulting in increased yield for homeowners. The process can take place at the time a new well is constructed or it can be used at any time on an existing well with low or declining yield. 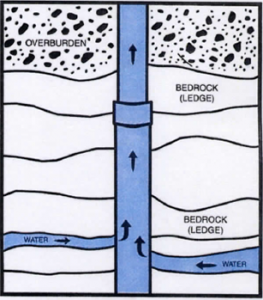 It is only suitable for wells receiving their water from water moving through fractures and fissures in bedrock. The technique involves injecting high-pressure water via the drilled well into the rock formations surrounding it. Hydrofracturing may widen fractures in the bedrock and extend them further into the formation and so increase the network of water bearing fractures/fissures supplying water to the well. 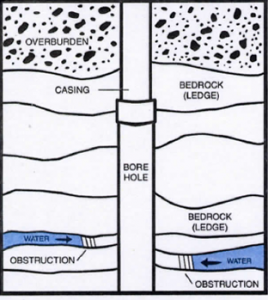 Hydrofracturing was originally developed to increase oil and gas well production and has now been adopted as a technique by the water well industry. 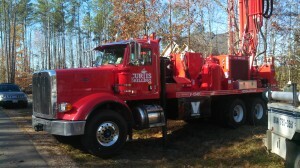 In most states, hydrofracturing work can only be undertaken by a licensed or registered water well contractor. The procedure involved lowering down the well one or two inflatable hard rubber “sleeves” or “balloons” (packers as they are more correctly called). First, all pipes, wires, and the pump need to be removed from the well. The packers are then inflated to seal off a section of the well. The packers are usually set a minimum of 20 feet below the end of the casing and 60 feet below ground surface. 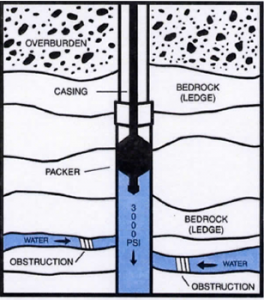 Water is pumped at high pressure into the section of the well between the packers, or below the packer if only one is used. Most hydrofracturing equipment for private wells can provide between 500 and 2000 psi pressure, sometimes up to 3,000 psi (pounds per square inch). Up to 50 gallons a minute is usually adequate as a pumping rate for adding water into the well. Some states have specific regulations relating to the hydrofracturing process. The water pressure within the sealed-off section of the well will rise as the surrounding rocks resist the flow of water out of the well. A sign of successful hydrofracturing is a sudden drop in the pressure indicating that the surrounding rocks are accepting water. If more fissures have been opened there is often a strong backflow of turbid water when pumping into the well is stopped. If however, during the hydrofracturing process the pressure in the well increased to the maximum working pressure of the equipment, with no sudden drop in pressure, then the hydrofracturing procedure may not have been effective. The cost for single packer hydrofracturing is usually less than when a double packer system is used. A double system allows for a selected zone in the well to be pressured by inflating both packers. The packers are usually first set near the bottom of the well and then moved up to another section. Selection of the zones to pressurize may be made from information on the well driller’s log or from a down-hole camera survey. Although not often used, some contractors may use proppants (small beads or sand grains) to keep open (prop) fractures and cracks in the rock. There may be permit and reporting requirements for hydrofracturing. Well contractors who specialize in hydrofracturing services will know whether “paperwork” is required. In order to assess the effectiveness of the hydrofracturing process the contractor will usually perform a “before & after” test of the well yield. There is the potential for the hydrofracturing process to temporarily influence water levels or turbidity in a close-by neighboring well if the two wells share some of the same fractures. There have been instances where packers set too close to the surface have caused a breakout of water above ground. The contractor should use high quality water (and/or water pumped in advance from the well to be pressurized) for the hydrofracturing process to avoid introducing any contaminants into the aquifer. After hydrofracturing, the contractor will normally purge the well of fine material but there could be some cloudiness in the water for a few days. We suggest having the water tested for its physical factors a week or so after the hydrofracture has been completed. The use of high-pressure equipment is potentially dangerous and homeowners should stay away from the wellhead when the hydrofracturing equipment is pressurized. It is normal practice to sanitize a well after any maintenance or well development work. You may have to wait 24 hours before the well can be put back into use. The beneficial effects of hydrofracturing should be permanent, and usually achieve a satisfactory water yield for less cost than drilling a new well. With more and more well contractors possessing the equipment necessary for hydrofracture, the process is becoming routine for areas where there are typically low yielding wells in bedrock.